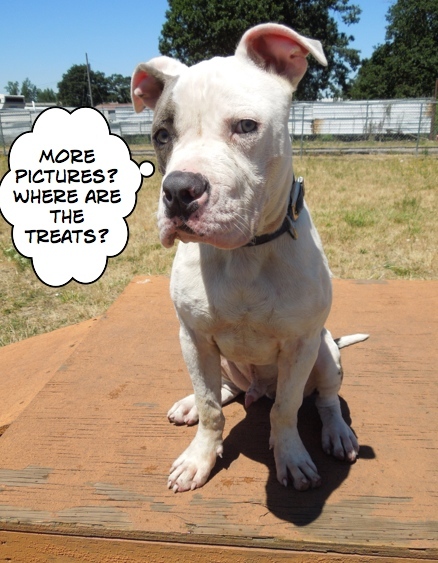 With all of the red, white, and blue costumes put safely away until next year (that is a sigh of relief you hear from my afternoon dog walkers), things are back to normal at Willamette Humane Society. 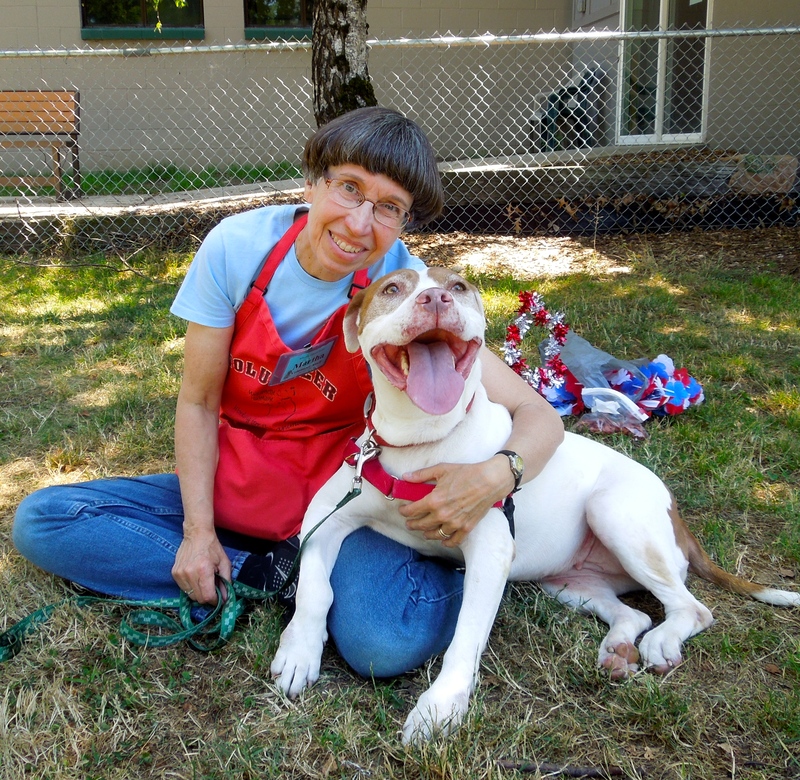 There were thirteen dog adoptions over the past week and ten of them were Blog Dogs! 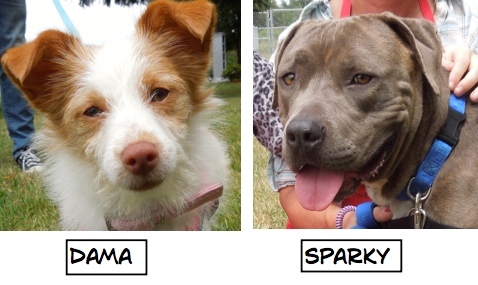 Here are the lucky dogs who are home with their new families as I write this post. Staff sent me these pictures. First, Rodeo going home. 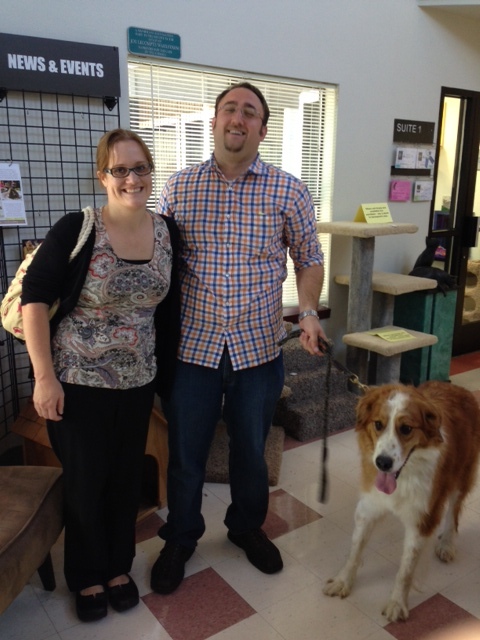 Everyone is so happy for this long-termer to finally have a family of his own! 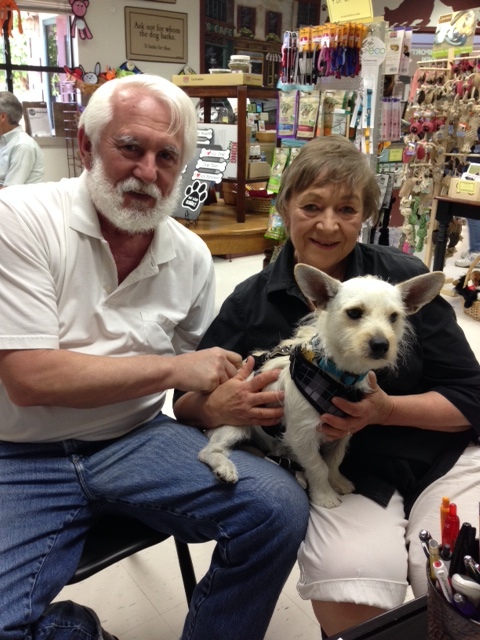 This is little Finn with his new family. Then there was Max. 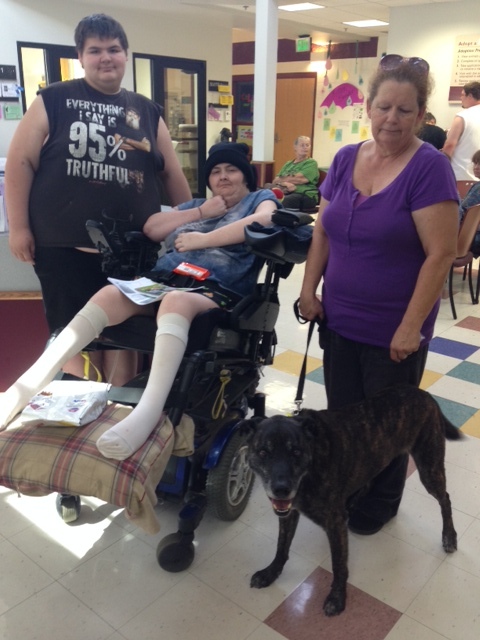 Here was the picture I took of him with Diane and Andrew soon after he arrived at WHS and the one I had planned to use in this post. 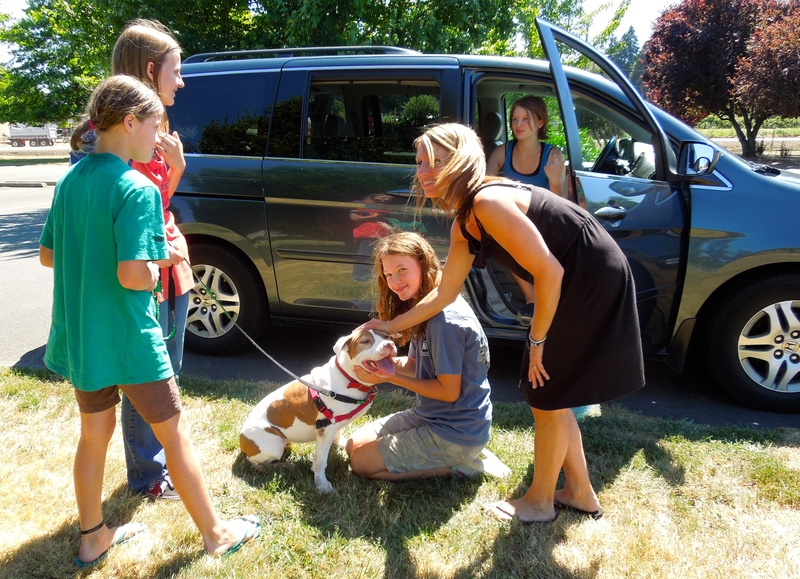 And here he is going home after one of the shortest stays at the shelter ever! Yay! The guy looks a little confused with all of the changes in his life. By now I’m sure he’s settled into his new family. 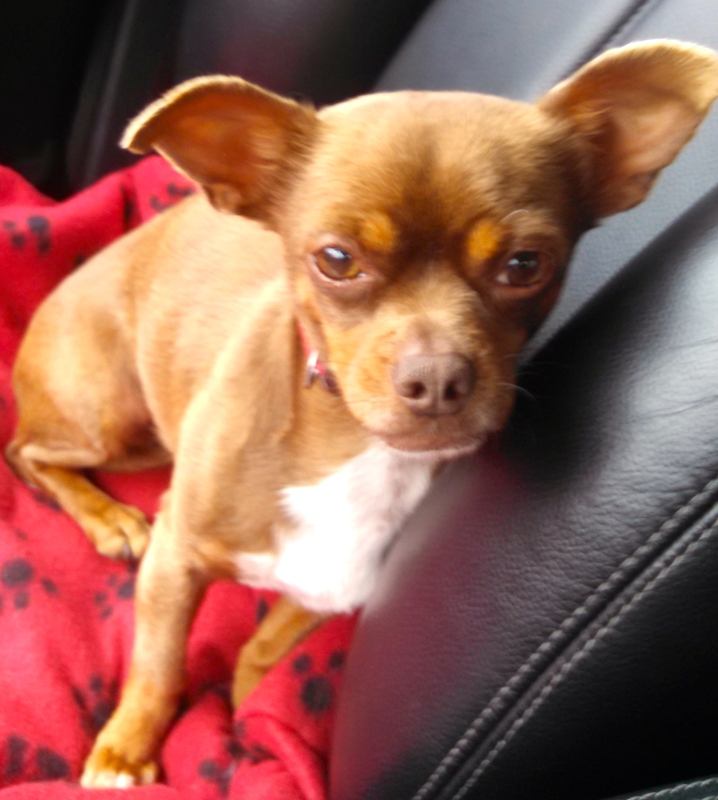 I’m little and a bit shy, but my foster mom says I’m a really good girl! 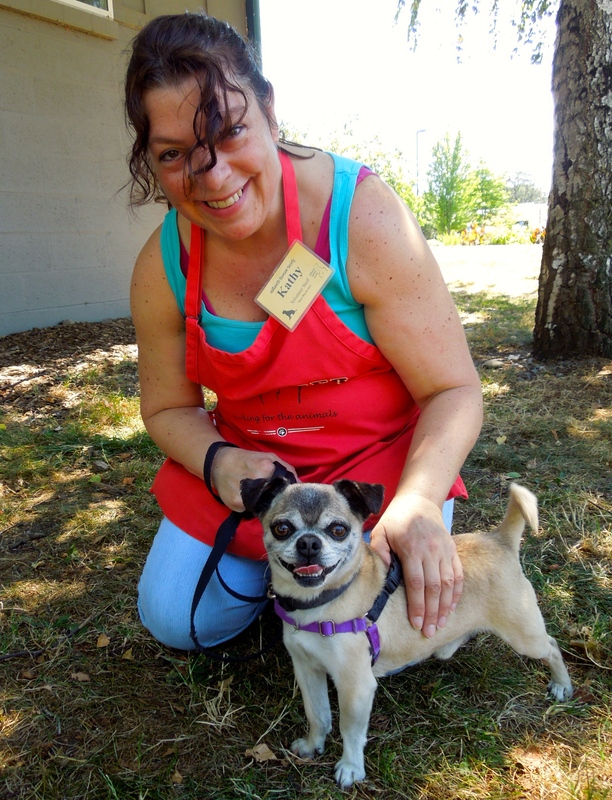 I’m going to start this post with little Coco, a five-year-old Chihuahua mix who has been in a foster home for the past several weeks. 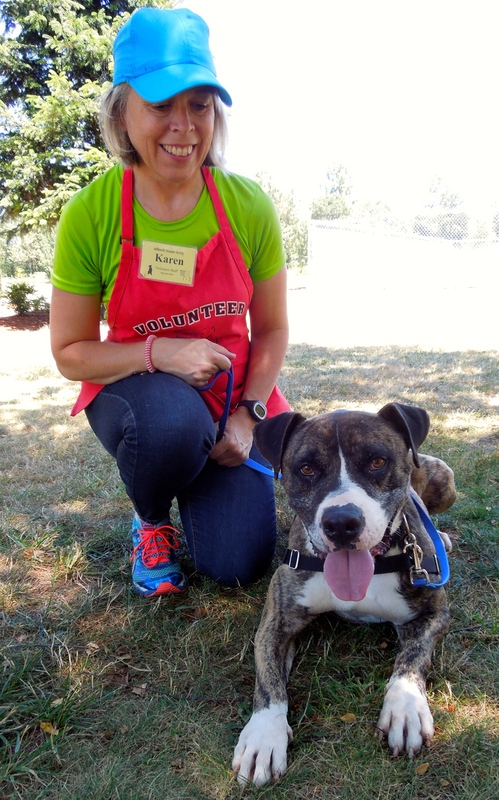 Here’s what her foster mom, Krystal, says about her. 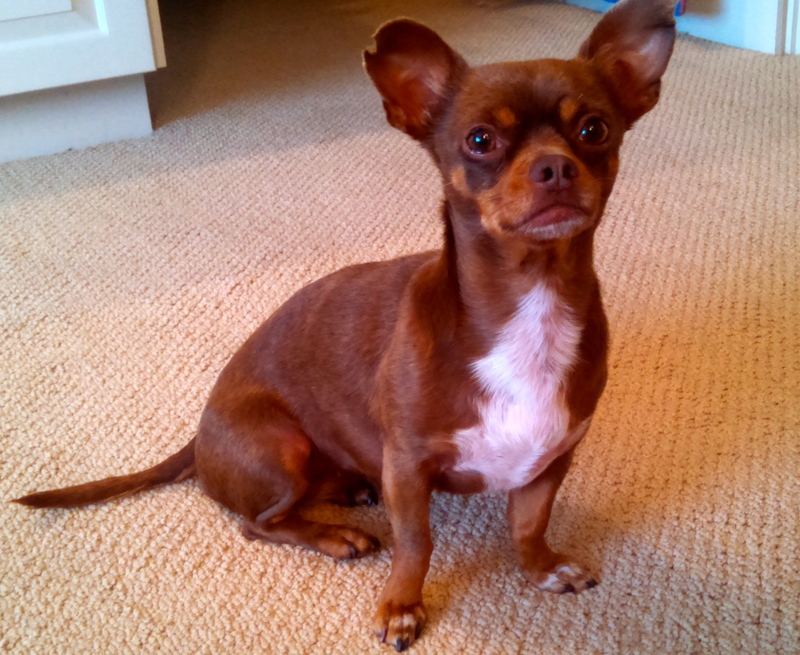 Here are some pictures that Krystal sent of Coco in her home. What a cutie! My name is Carla and I’ve been here quite a long time. Wouldn’t you like to adopt me? 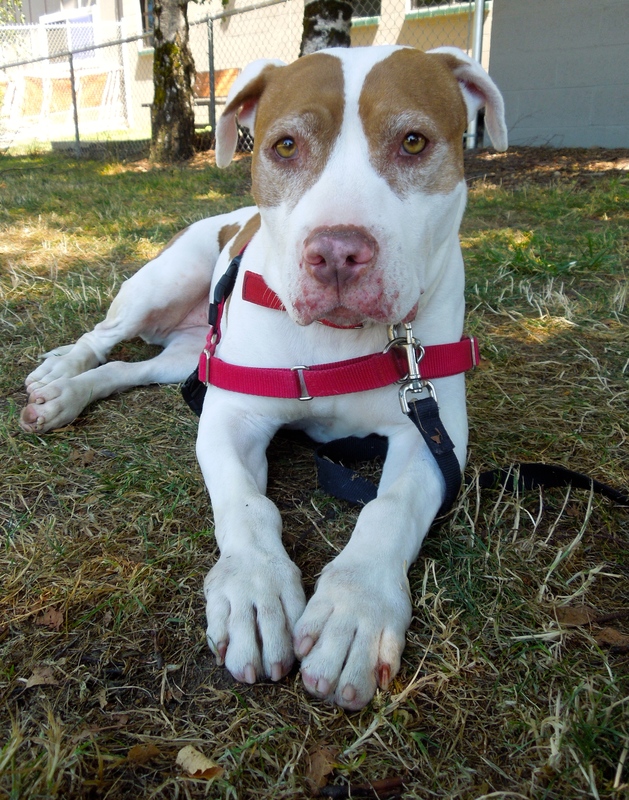 Carla is a six-year-old Boxer/Lab mix who has been at the shelter since June 19th. She came to us from California on a S.T.A.R.T. transport. 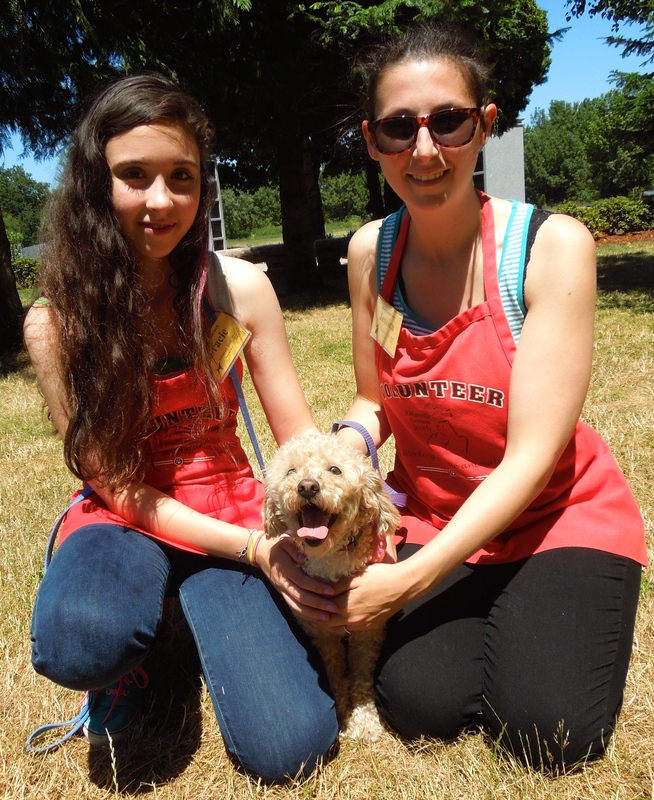 We don’t know anything about her background, but she has worked her way into many volunteer and staff members’ hearts. She loves to go for walks and spend time with her peeps. Here she was on Sunday with Alexis. She knows some commands and is treat-motivated. 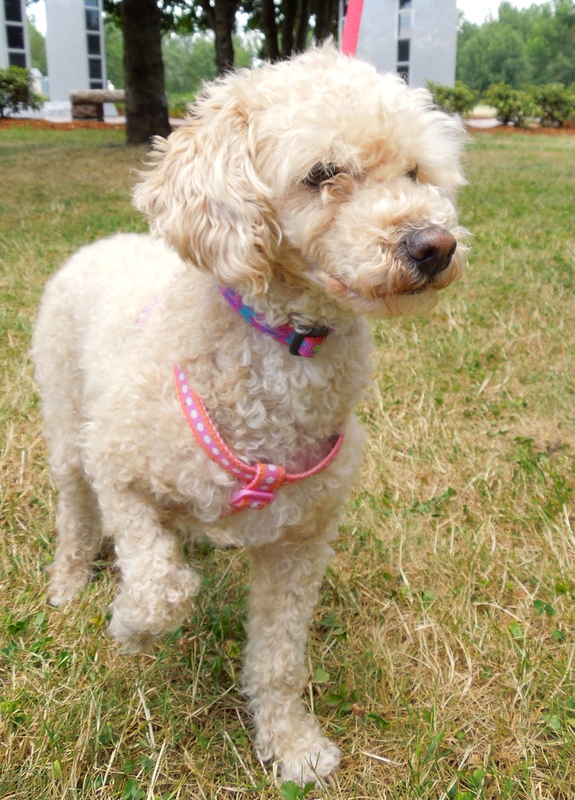 She has been working on learning polite leash-walking and is doing better. I’m hoping this sweet girl will be adopted soon! 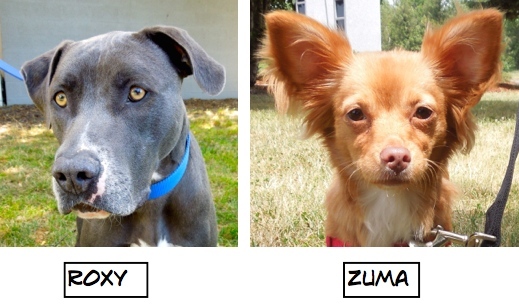 Still looking for my new family! Yep, I’ll be your very best friend if you’ll let me! 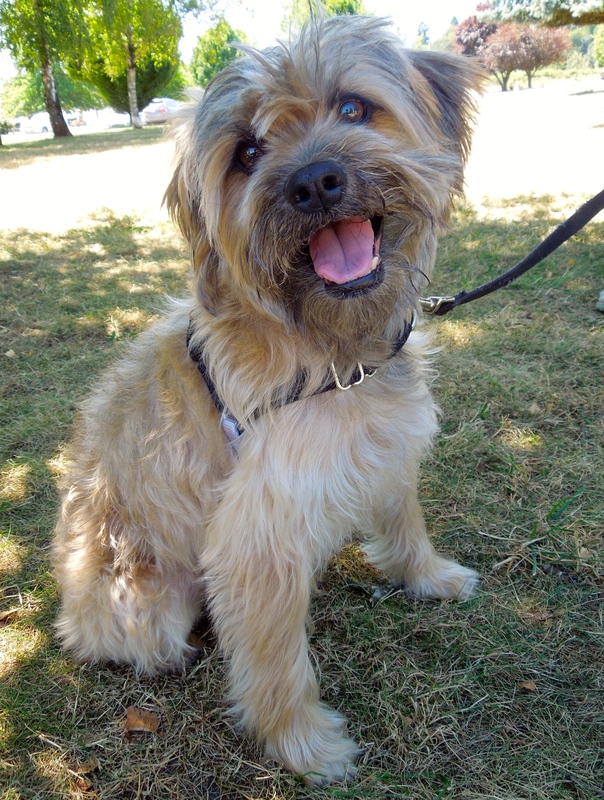 Buddy is also turning into a long-termer, having come from California on the same transport with Carla on June 19th. 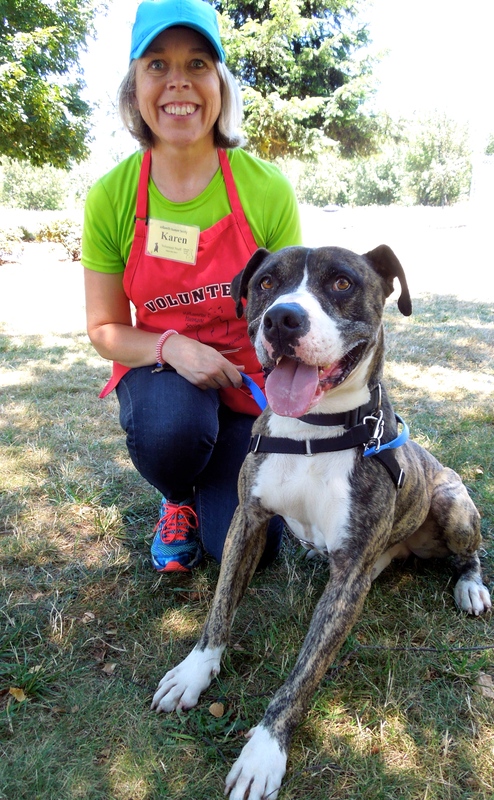 Buddy needs to be an only pet, as he did not do well in a play group with other dogs. He loves people and treats. He’s become one of my favorites, even happily dressed up for the 4th for my pictures. I’m hoping just the right family will find this good boy! Here he was on Sunday with Karen. Are you a Jack Russell fan? If so, I’m your girl! 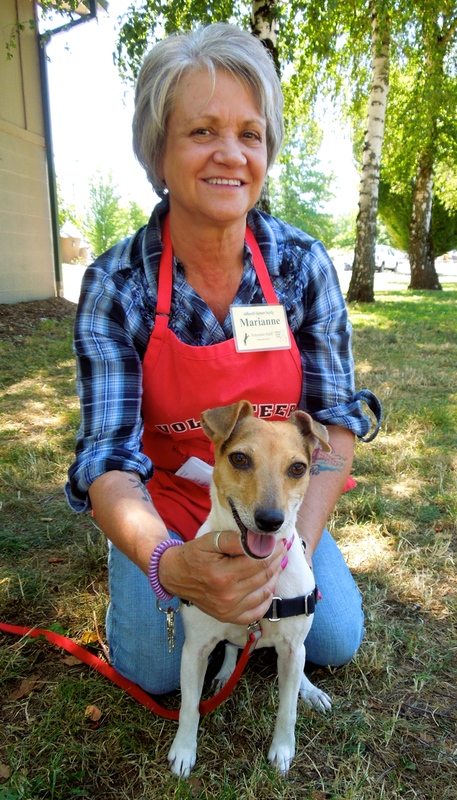 A newbie I met on Sunday is Zeba, a six-year-old Jack Russell Terrier mix. 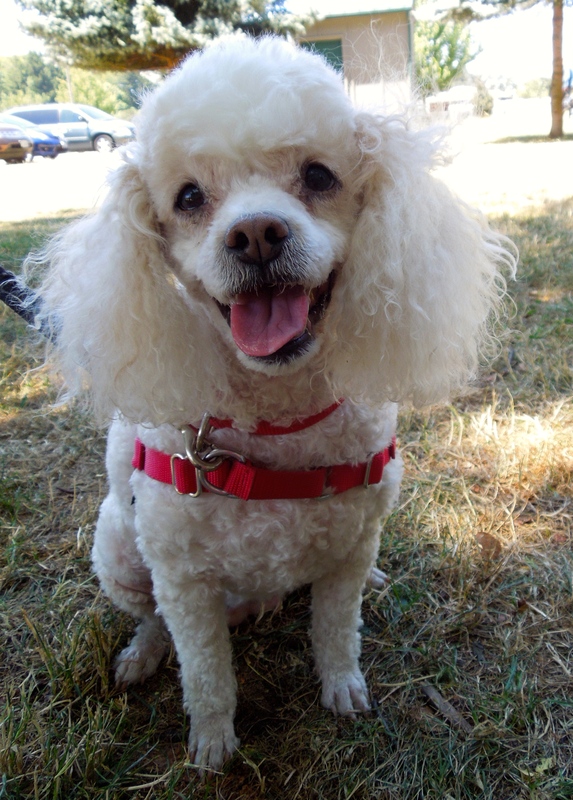 She is a very energetic girl who is eager to meet her new family. Trying to get her to stand still for pictures was quite a challenge! She will need to be the only pet in the family, as she does not like to share her people with either other dogs or cats. 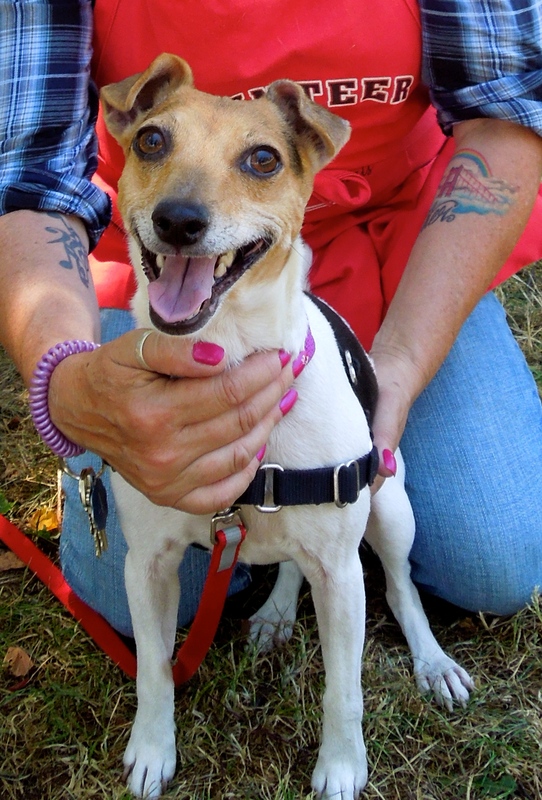 But if you love Jack Russells’ energy and joy of life, this girl may be the perfect fit for you! I’m called Puppy Sam, but you can call me Sam! 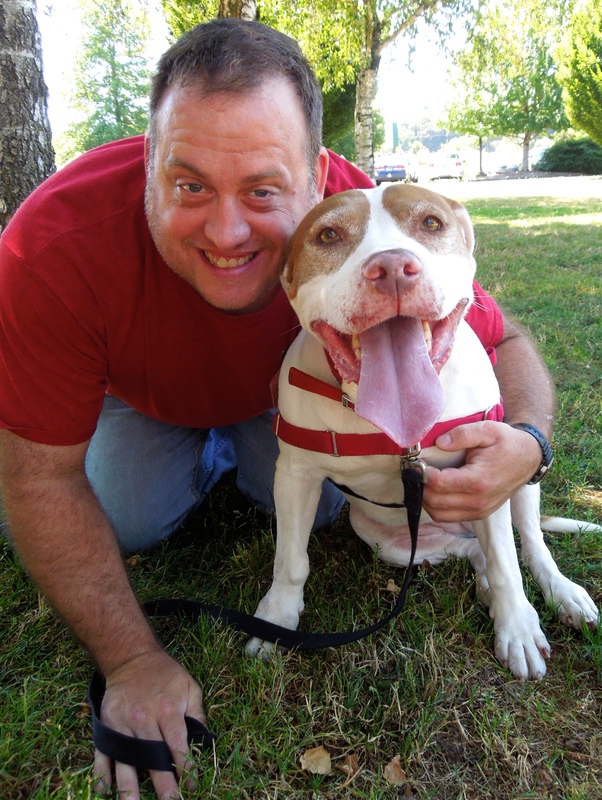 Sam is back at the shelter after spending a couple of weeks in a foster home. He is such a fun big puppy character. 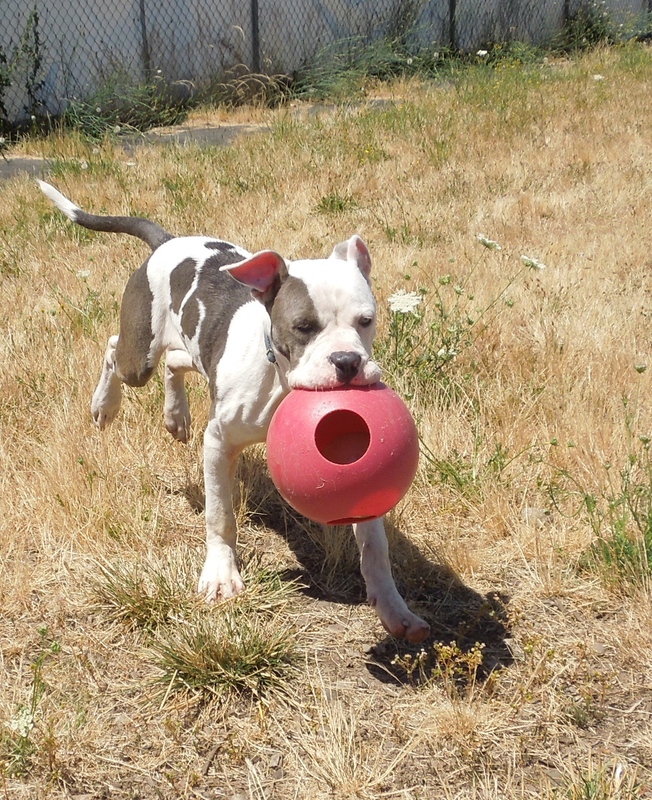 He is a six-month-old American Bulldog mix and is ready for an active new life in a forever home. 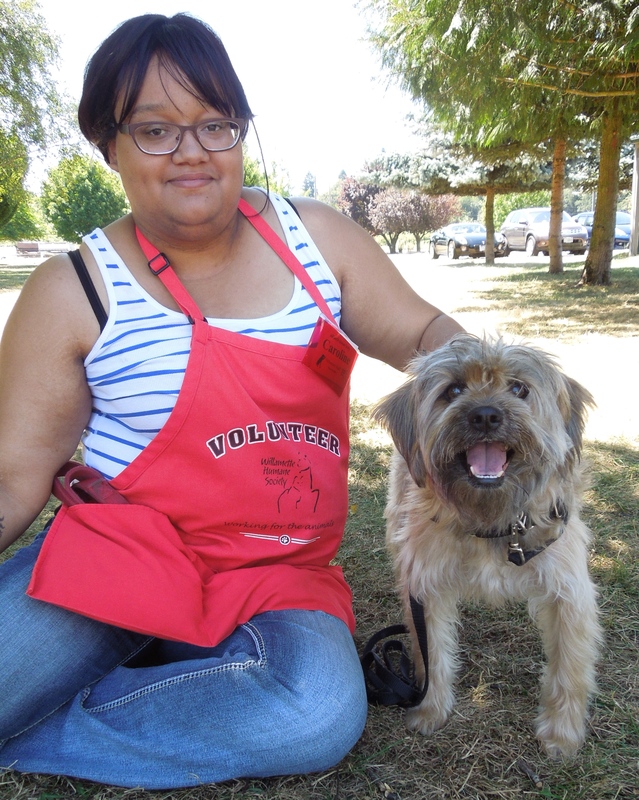 Here he was on Sunday with volunteer Krista. I took him out for his walk this afternoon and he was much better behaved than he had been the last time I took him. In his kennel, he sat when I asked, and let me put his harness on with no mouthiness. He walked with me to the big yard without pulling. 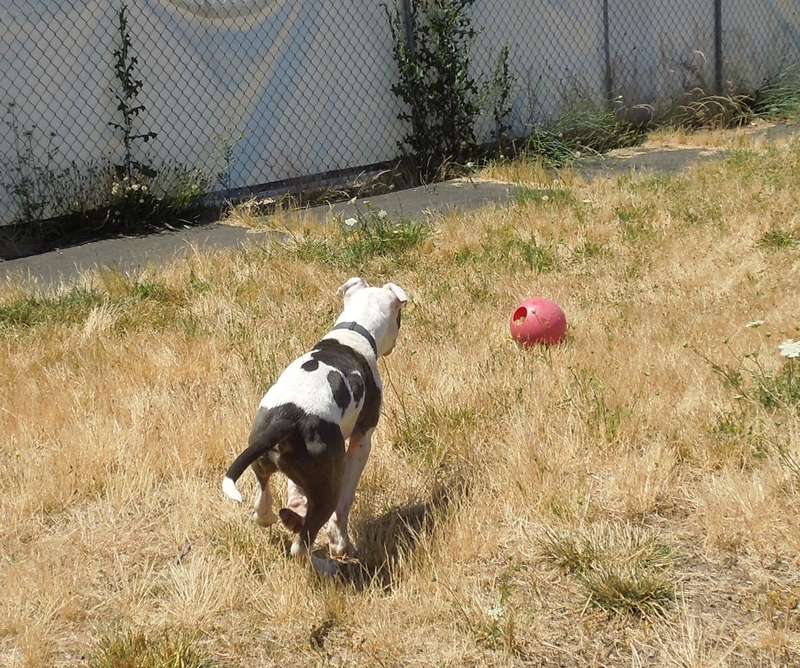 He is such a quick learner and loves his time with people and other dogs. 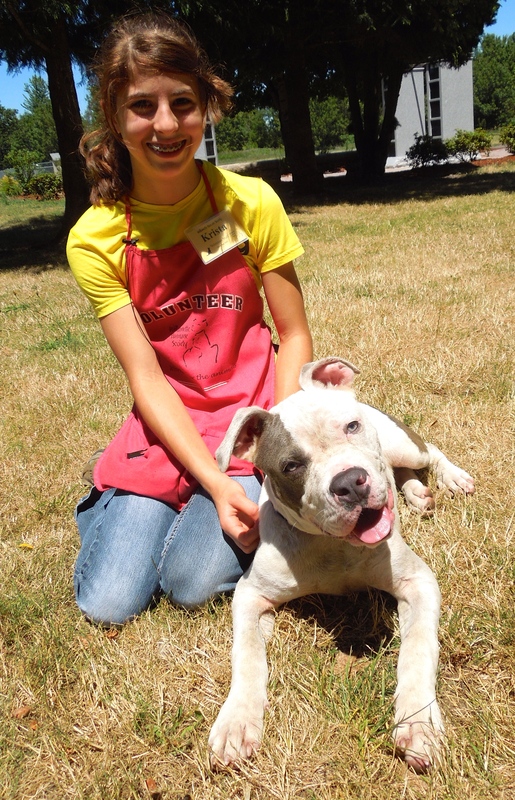 (An added bonus to his adoption is a WHS class called Check In and Chill Out.) 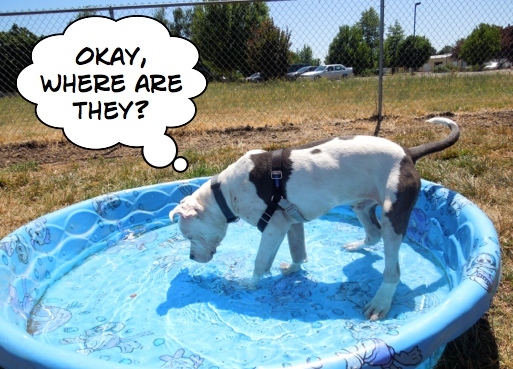 I had heard from Caroline that Sam loved playing in the pool with other dogs during play group. However, he was at first reluctant to step in it by himself. So I threw in some hot dog bits. A little later he jumped up on the ramp. He decided he didn’t want to work for free. And then it was time for some ball playing. 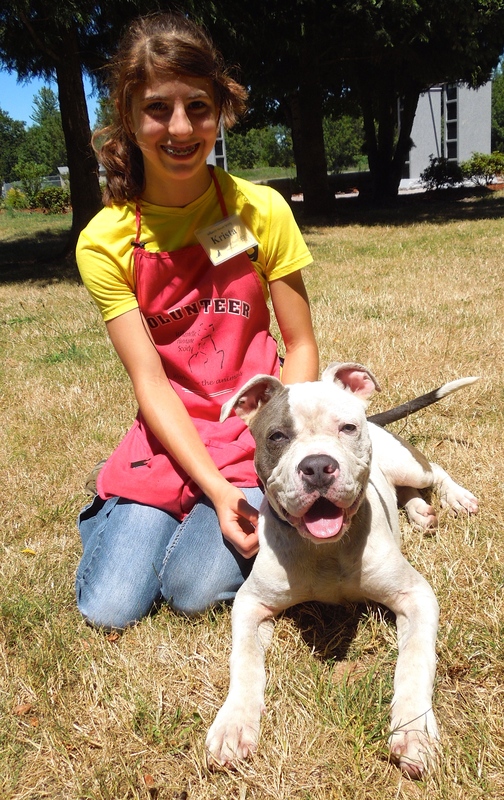 With continued training, this giant pup is going to grow up into a wonderful family dog. I hope he’ll find his forever family soon. 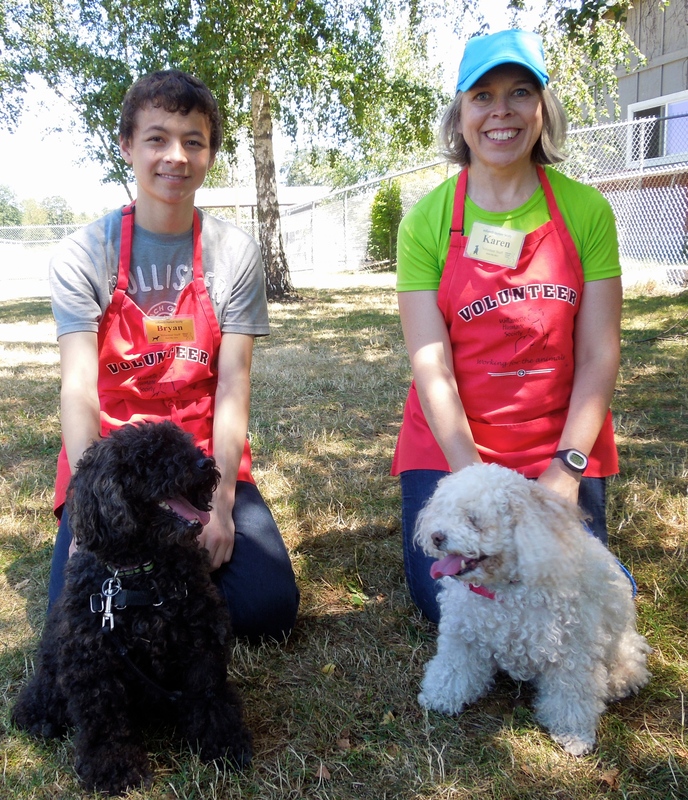 On Sunday I snapped this picture of Bryan and Karen with Nigel and Bailey, two ten-year-old bonded Poodle mixes looking for a home together. 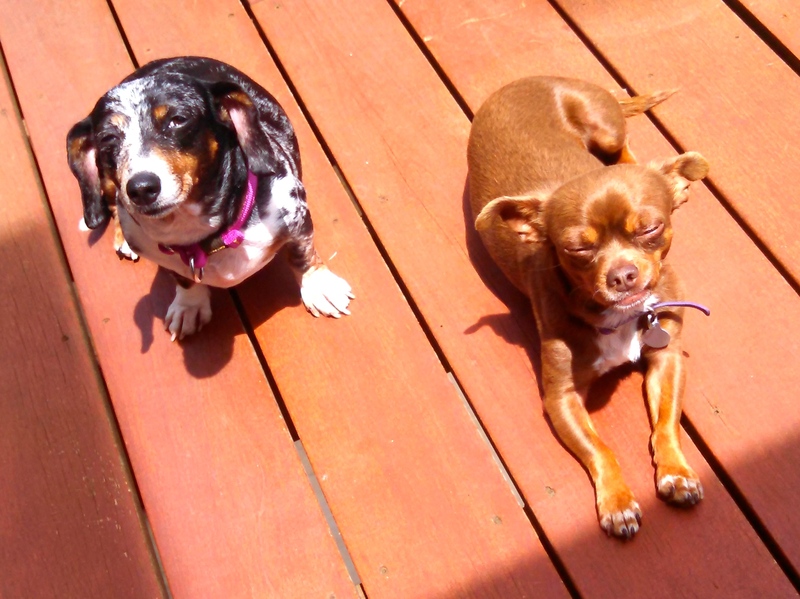 This afternoon, I was thrilled when I saw they both had been to the spa and gotten haircuts. What a difference! Here they are with Kathy and Angie. You may be as surprised as I was to see Angie again! 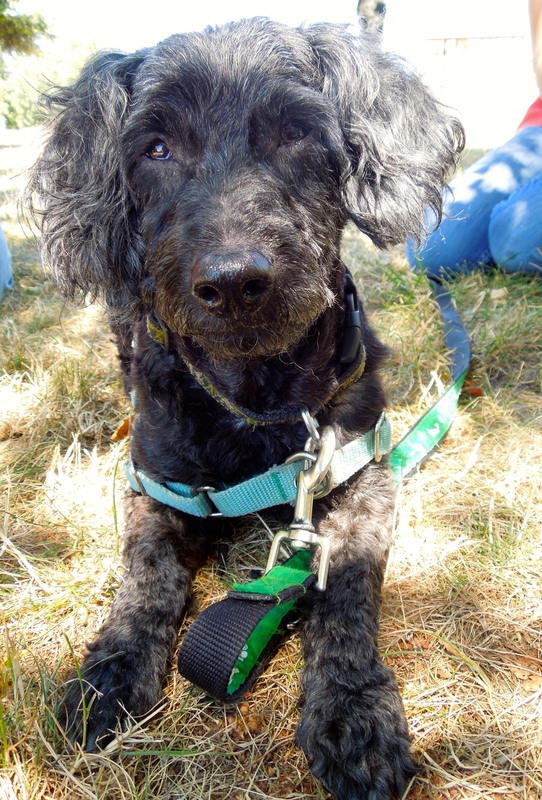 She appeared in many of my blog posts until she moved to Arizona with her WHS alumnus, Finn. And if you read my posts regularly, you’ll remember that Finn himself wrote an update last week. 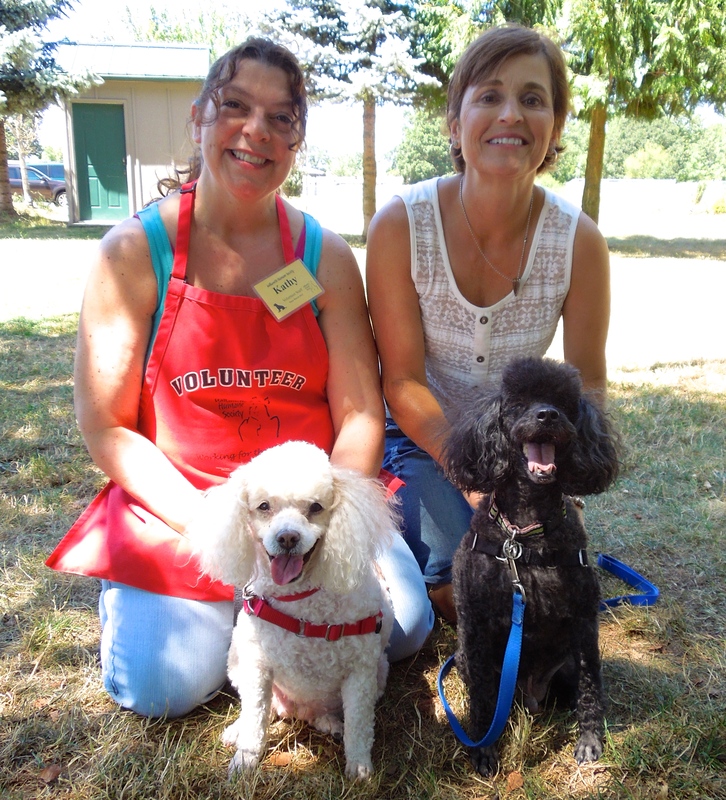 Angie and her husband are in town visiting family and she wanted to come see her old dog-walking team members and the dogs today. It was so much fun to see her and catch up. She’s about to start volunteering at her local humane society. Thanks for coming today, Angie! Here are closeups of the new hair styles. 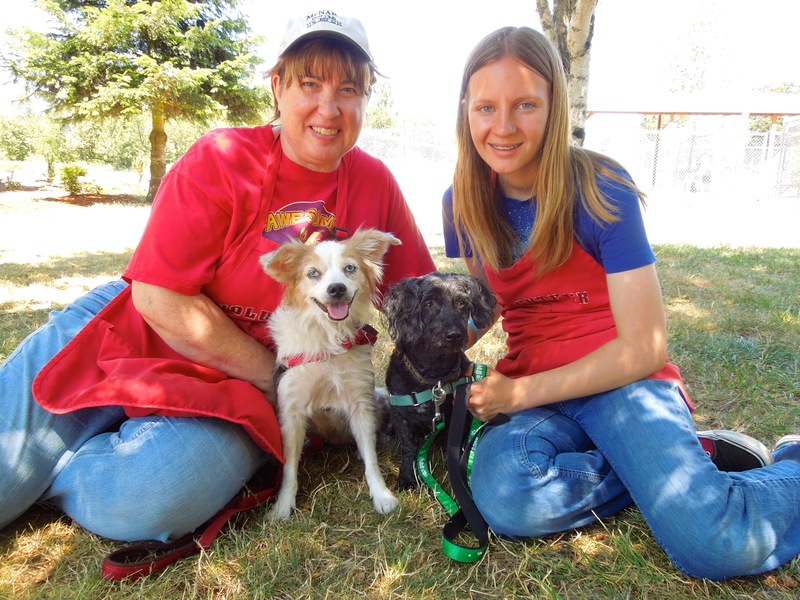 Nigel and Bailey are delightful little dogs who are looking for a calm, quiet family to live out their senior years. 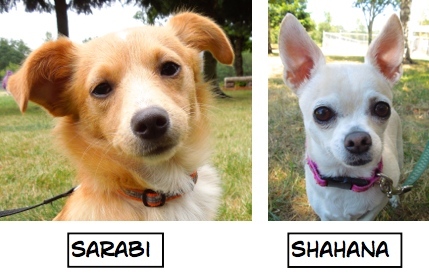 They will make some lucky person excellent companions. 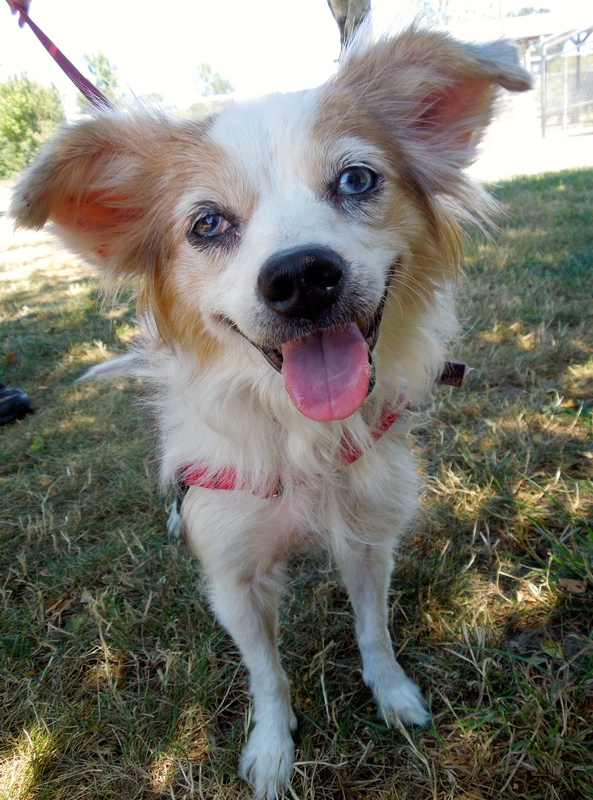 I’m new here at the shelter, and I’m cute! Pete is adorable. He is house-trained, though needs to go out frequently. 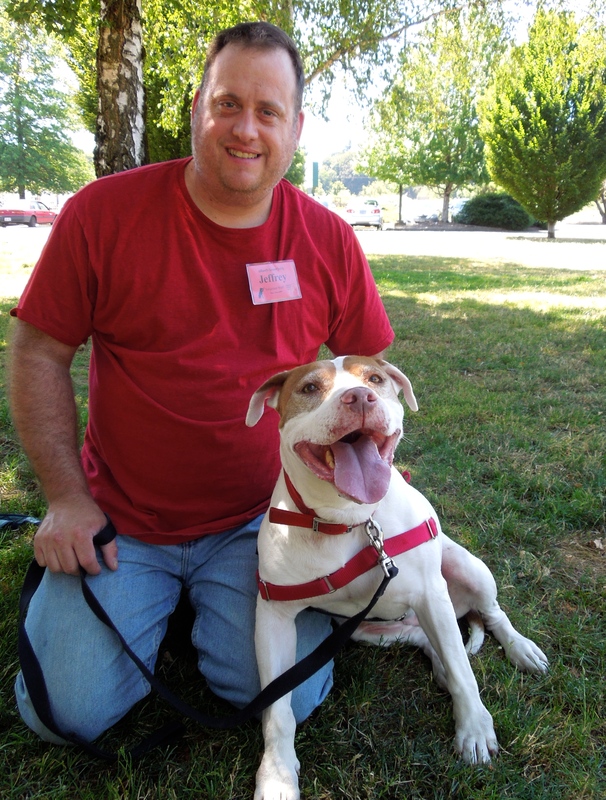 He has lived with cats and other dogs happily, as well as children. He does need slow introductions in the beginning. He LOVES people. He enjoyed posing for my camera and munching my hot dog bits. This little guy is a keeper! Debbie and Emelynn spent some time with Lady Lynn and Curly today. Curly looked great with his new hair trim. 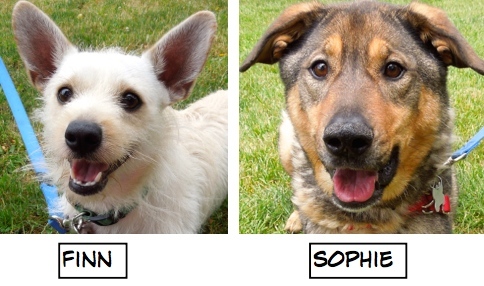 Both dogs are Spaniel mixes and are about ten years old. Though they don’t have to go to a family together, it sure would be nice if they did. Lady Lynn is quite the smiler, while Curly is more serious. 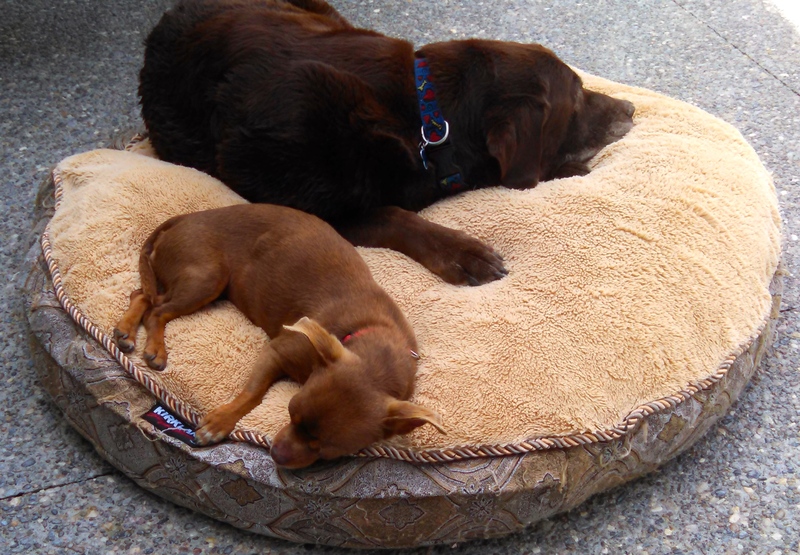 Both get along with other dogs and kids. They are wonderful little companions. Kathy fell in love with me today. Will you? 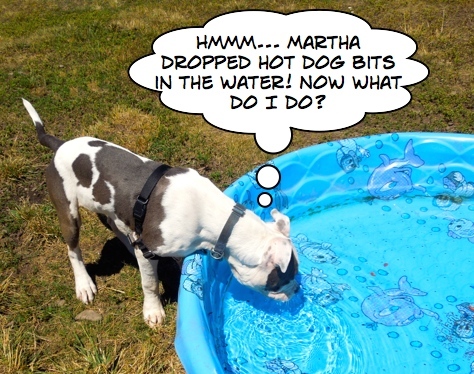 I knew Kathy was a goner when I heard her meeting little Marbles in his kennel today. 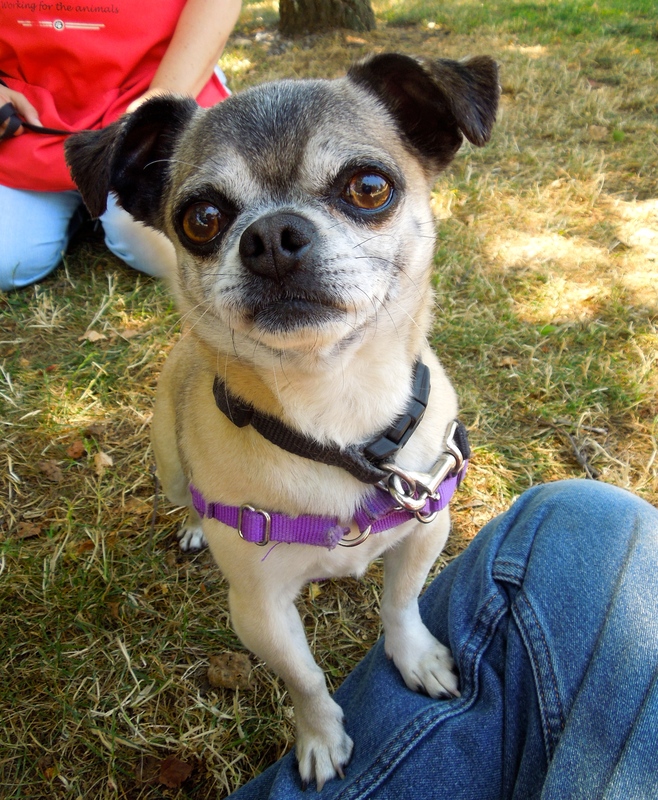 Marbles is about eight years old and is a Pug/Chihuahua mix. 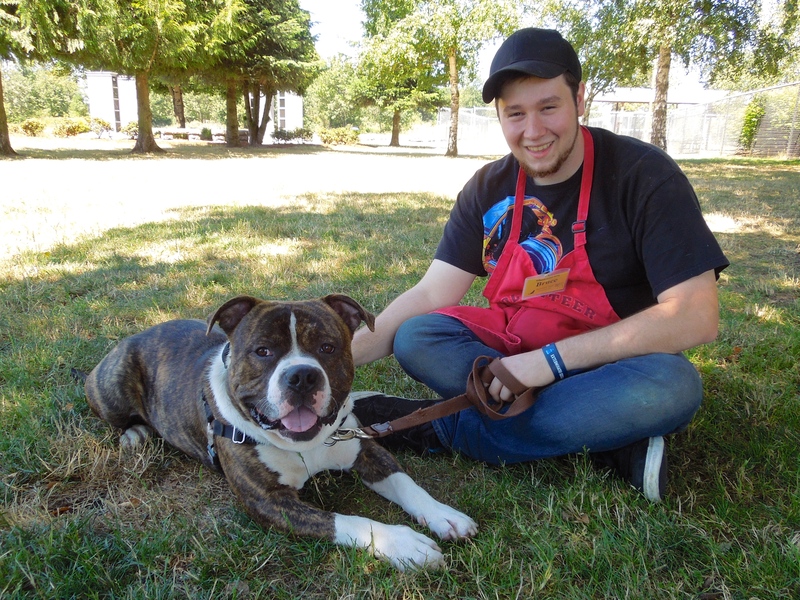 Since he came to us as a stray, we don’t know his history, but he scored very well on his behavior test, so should be an easy fit for a family. He’s very friendly, trots around like he owns the place, and took my treats politely. Kathy was smitten and gave him lots of attention today. I have a feeling he’ll be adopted quickly. I’m very popular here at the shelter. Perhaps you should adopt me! 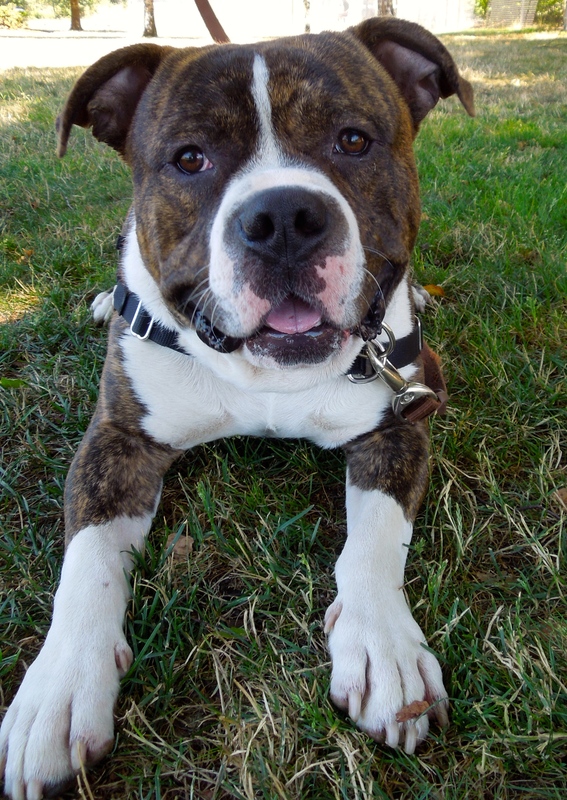 Meet Chavo, an eleven-month old American Bully mix. 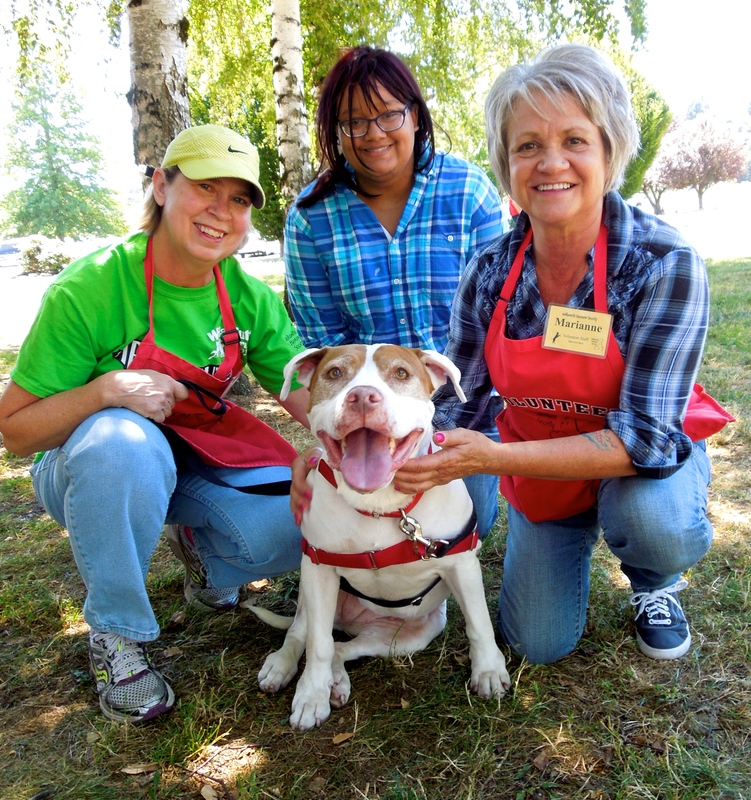 He has become quite a favorite of many staff and volunteers because of his gentle nature. He is good with both other dogs and kids. 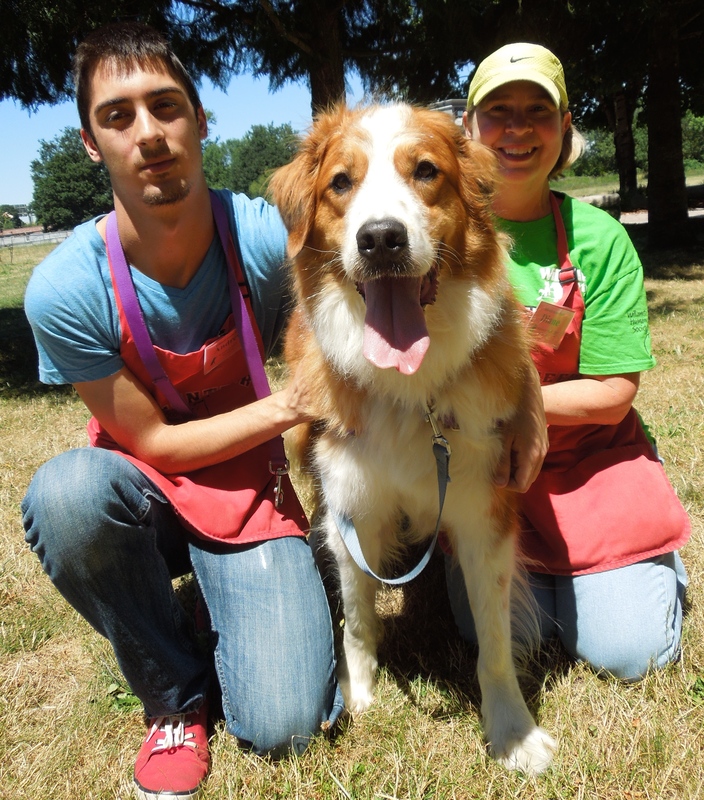 He will need some potty-training, as he was only an outdoor dog in his previous home. But he seems to be a quick learner and will make a wonderful family member. Here he was on Sunday with Bruce, one of his many fans. I’m Bella. I am looking for a patient person to help me relax. 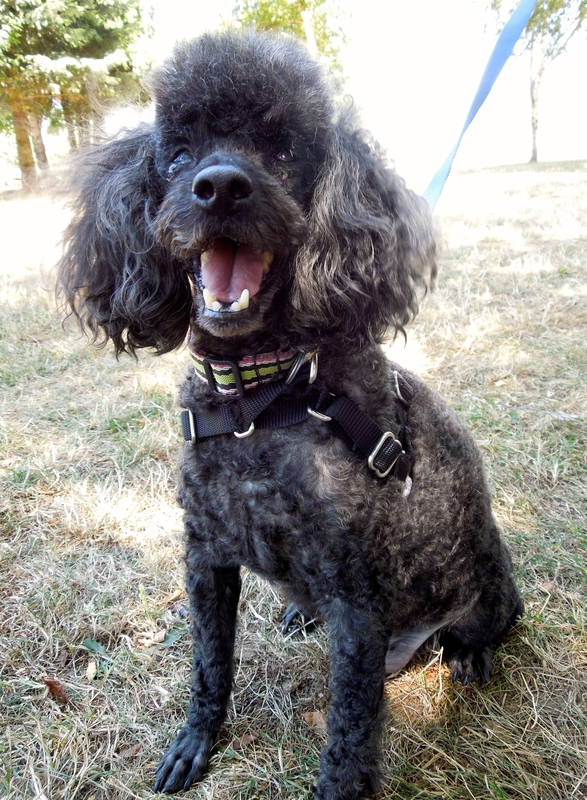 Bella is a purebred Miniature Poodle who is four years old. She will need someone willing to work with her to help her get over her need to vocalize whenever she is stressed. She’s not a good apartment dog. 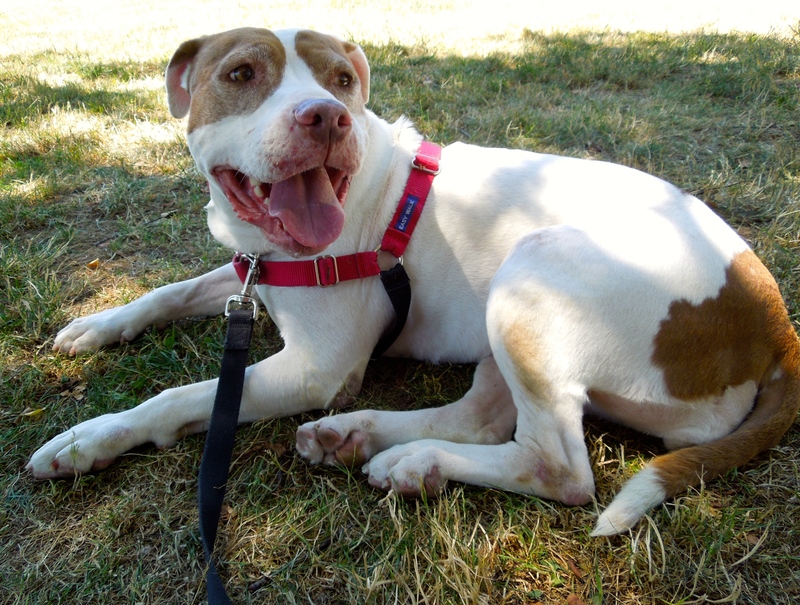 Bella is an affectionate, trusting little girl when she feels safe. 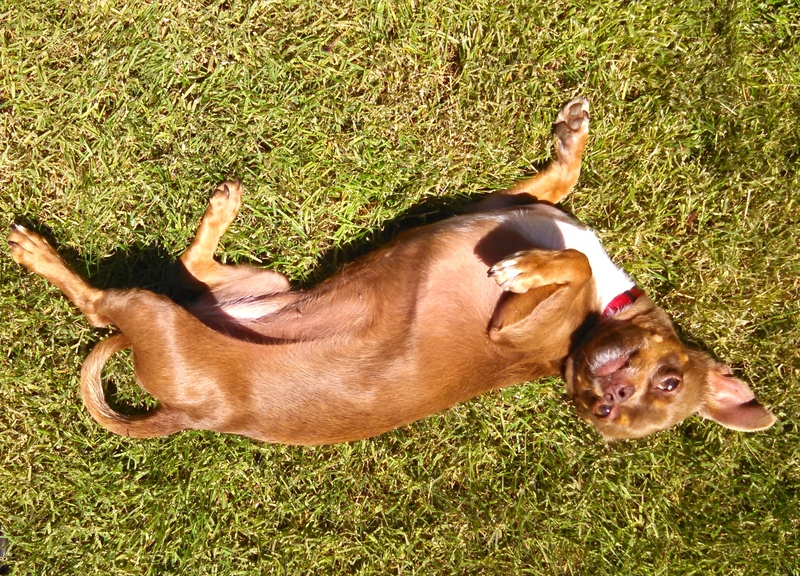 She loves to play ball in a yard and took my hot dog bits enthusiastically. I’m hoping she’ll find just the right home. Here she was on Sunday with Gracie and Jessica. I’m Spanky. I’m trying hard to be a good boy! 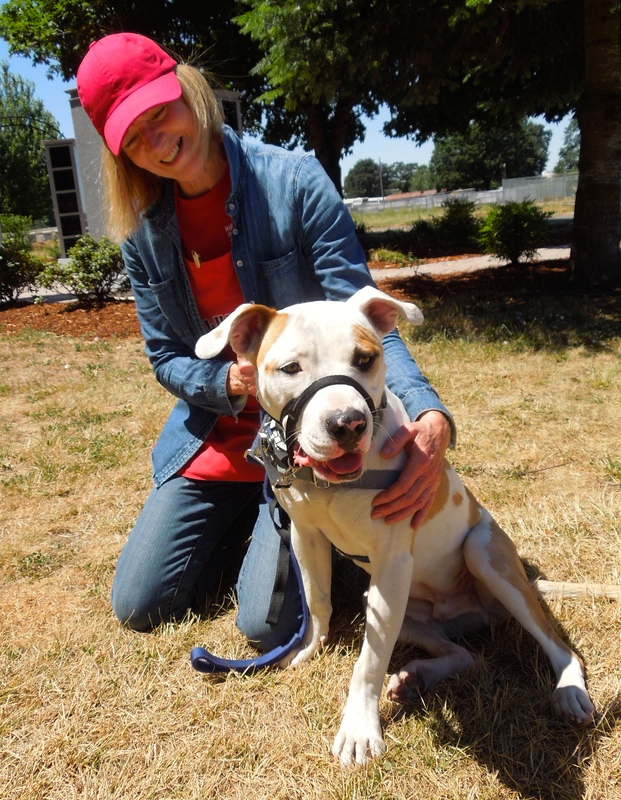 Spanky, a one-year-old Pit Bull Terrier mix, has been waiting for his forever home since arriving at WHS on June 6th. 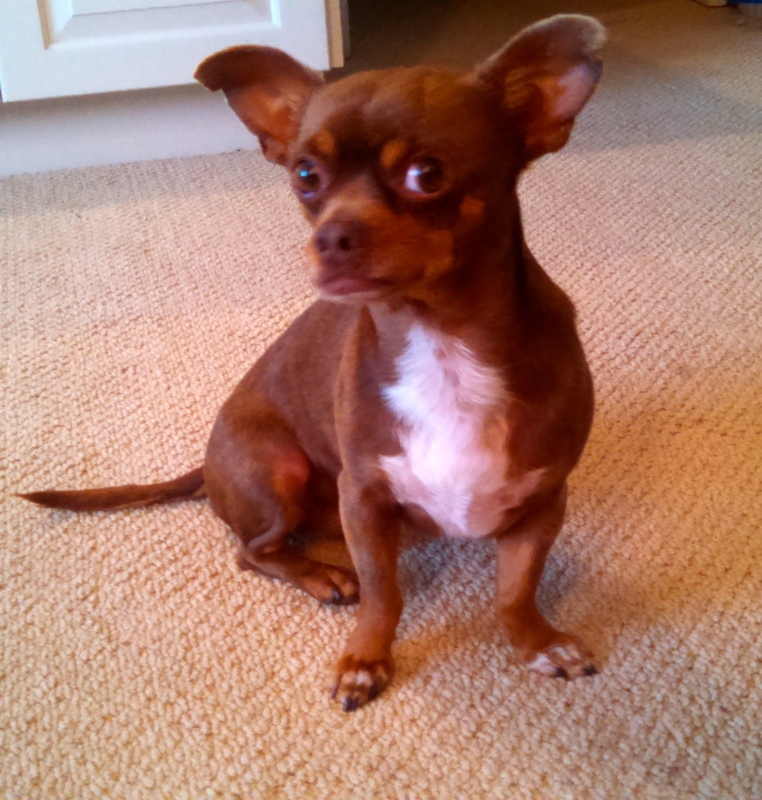 He actually came to us as a puppy and was adopted, but then was picked up as a stray in June. He is a very active young boy who loves play group. 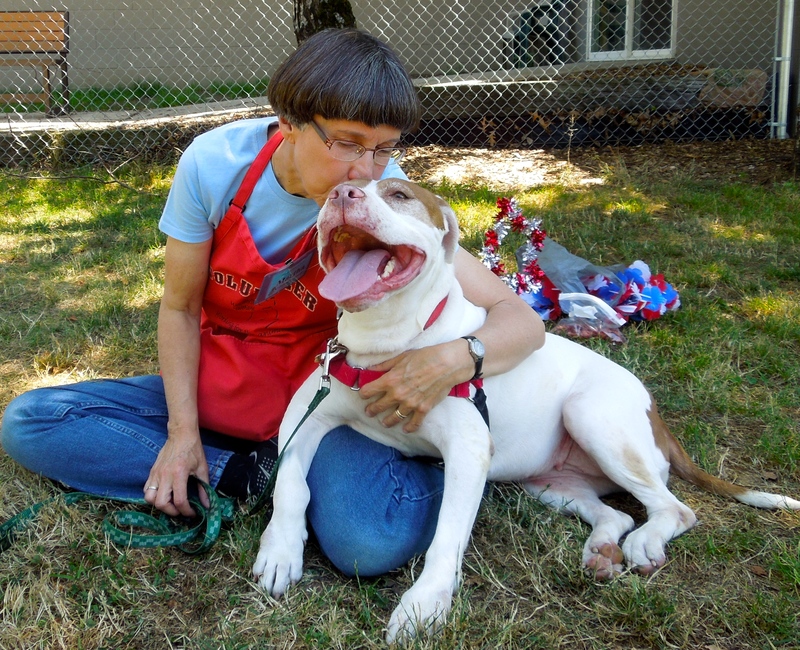 He is a rough-and-tumble player but tolerant of other dogs’ behavior. 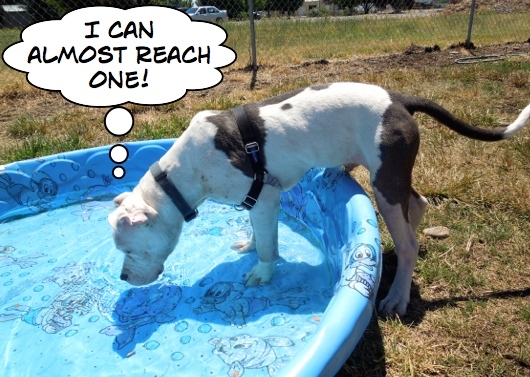 He’s looking for an active family so he can go on adventures. He’s working on being less mouthy. Jolene used a Halti with him today and he did much better staying calm and walking nicely on leash. This boy just needs a family who will take him to WHS training classes so that he will become the well-behaved adult that he wants to be. Emelynn’s (and my) Pick of the Week! Emelynn and I spent some quality time with Sheila, our current favorite, before we went home today. If you are a regular reader of my posts, you know Sheila well. 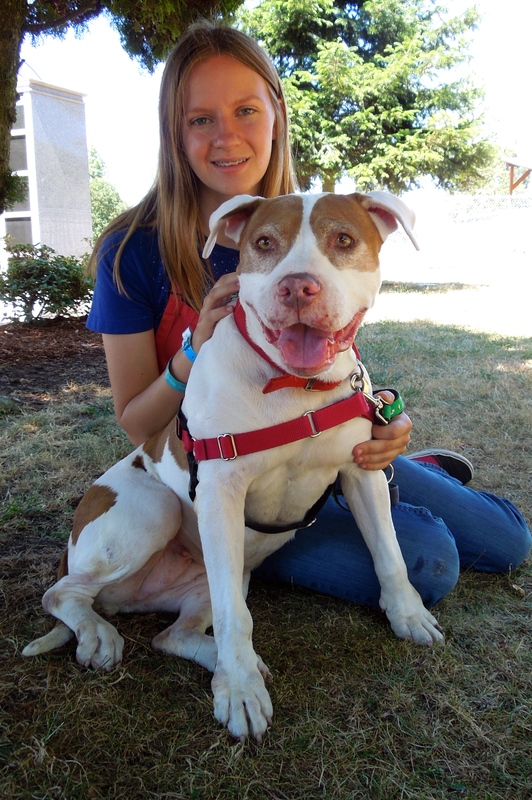 She is a five-year-old Pit Bull Terrier mix who, after spending five months in a shelter in California, came to WHS. 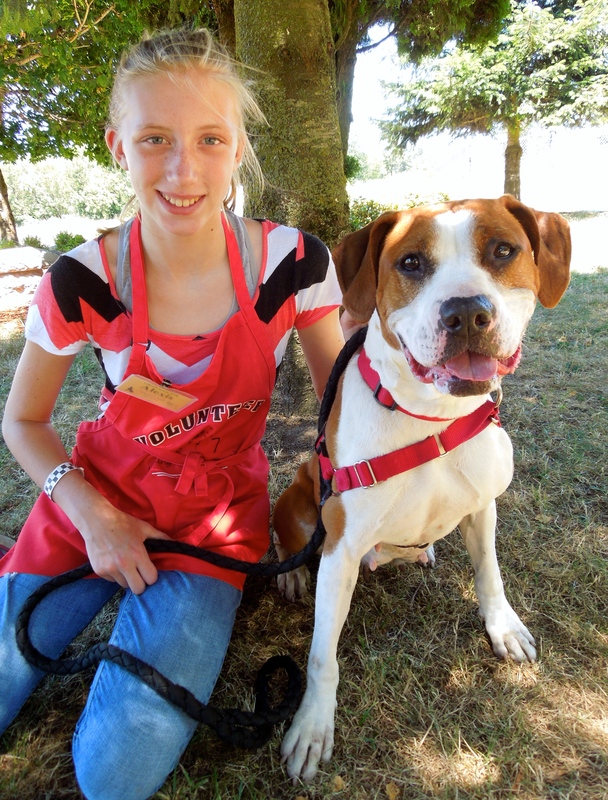 She has been waiting for a forever family here since May 3. Here she was today, ever hopeful that her new family will come soon. Emelynn was still hanging out with Sheila when Emelynn’s family came to pick her up. As you can see, Sheila thoroughly enjoyed the attention. I had spent extra time with Sheila relaxing under the trees on Sunday. Several of her fans stopped by to visit. 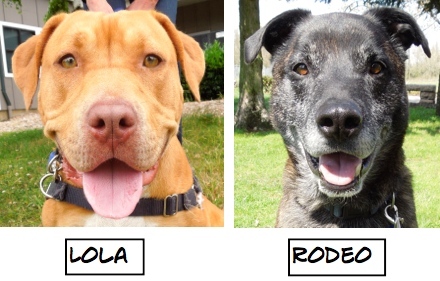 Here are some of the many faces of this sweet and deserving dog. Jeff stopped by to say hi. Diane, Caroline, and Marianne spent some time visiting with us.